The installation process for air source heat pumps in your building will depend on the type of air source heat pump you’re installing, whether your system will include mini splits or a central packaged system, and whether your system is ducted or ductless. Before you can start an installation, your contractor will visit your home to assess your heating and cooling needs. They may perform a “Manual J” calculation, which gives them information about heating and cooling loads for your home. A Manual J is also frequently required for you to be eligible for any state and local incentives. If you’re looking at a ducted system, your contractor will also inspect any existing ductwork to make sure it’s efficient and well-sealed. During the visit, contractors will also ask questions about your existing heating system, and the goals of the project. For example, are you looking to only heat a new addition to your home, or do you want to cover as much as possible with air source heat pumps? This will affect the type of air source heat pump system they will install. Most installers will start by setting up the indoor unit for your air source heat pump. If you’ve chosen to install a ductless system, the contractor will locate an unobstructed place on the wall inside the zone to place the unit. He or she will install a mounting plate to hold up the indoor unit, and then secure the indoor unit to it. If you’ve chosen a ducted system, your installer will also need access to your ductwork and so that they can connect the indoor unit to the ductwork (whether in the attic, basement, or elsewhere). If you have existing ductwork that the contractors will use, they may also take this time to do any necessary repairs to maximize the efficiency of your new heat pump system. If you don’t have existing ductwork in your home, installing ductwork to circulate the air will be one of the first steps they take. There needs to be an access point between the indoor unit or air handler and the outdoor condenser. To create this, your installer will drill a hole in the wall to run piping and lines. This will provide an outlet for the refrigerant lines, electrical lines, as well as a condensate drain line that will transport water from the indoor unit to the outside. The installer will use a hole saw on the exterior of your home, as well as the room where the the indoor unit is installed for a mini split system. In a ducted system, the access point is where the indoor air handler is going to be located in your home (most often in an attic or basement). Next, the refrigerant line and the condensate line are connected to the indoor units. The refrigerant lines allow refrigerant to cycle through the indoor and outdoor condensers. 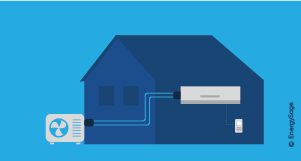 Depending on whether your air source heat pumps are heating or cooling at the time, the lines will transport warm or cool liquid to the indoor units, which is then forced as air in the zone. Once the indoor unit is ready, your contractor will install the outdoor unit. For larger (packaged or central systems), installers will typically put a concrete slab on the ground to hold the outdoor condenser. If this is a mini split system, or a air source heat pump with a smaller system, it will often be mounted to the side of your home. This mount will typically be lifted above the ground, especially in colder areas where the installer will ideally mount the system above possible snowlines. 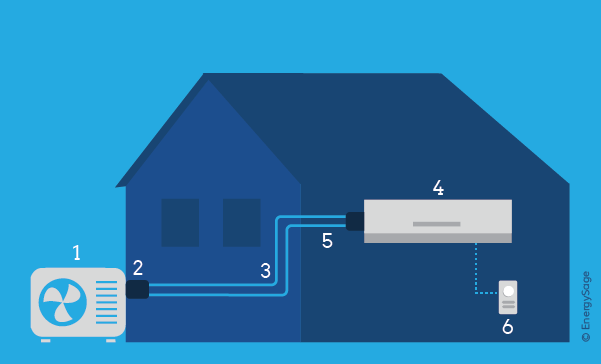 After the indoor and outdoor unit are installed, your installer will connect them through the refrigerant line and electrical wires. Installers will either insulate these lines and run the lines through conduits on the side of your home to protect the wiring from the elements. A drain line will also be installed on the outside of the home to bring condensation from the unit away from the inside of your home. There are a few finishing touches that need to be completed to finish installing the system. One is to affix the pipes to the sides of your home so they’re secure. Another is to install sensors – many air source heat pumps will come with sensor technology to communicate the temperature in different zones to your thermostat. Many air source heat pumps also come with wireless remotes to adjust the temperature, and allow monitoring and changes to be done with an internet connection on your computer, tablet, or phone.